Subtitle: Generative art explorations through visualizations of natural phenomenon. Mark making explorations through generative and computational translations. 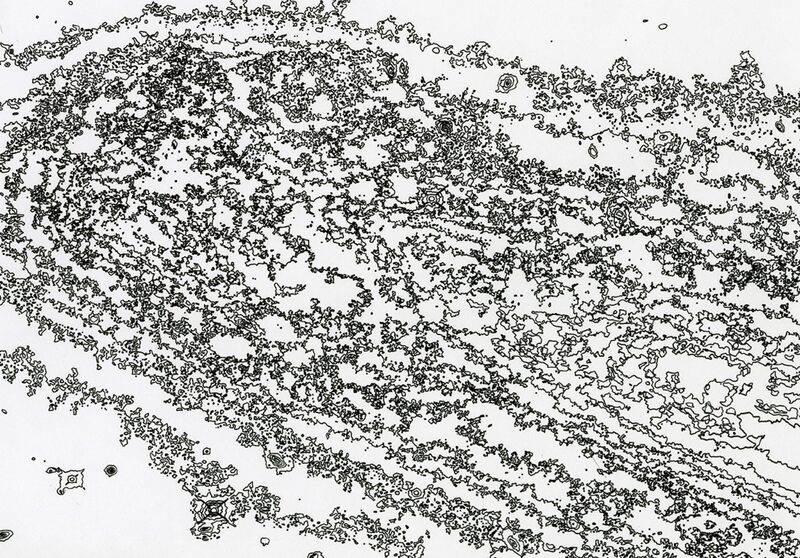 1) Generative art explorations through mark making experiments and computational translations. 2)Generative art explorations through visualizations of natural phenomenon. 3) Visualizing natural phenomenon through generative art. Machines and technology are ubiquitous in our lives and are also present in something as subjective as art. Generative art is created through an autonomous and procedural system. The current dialogue about generative art involves questions about originality and agency. How much creativity is derived from the program and how much from the programmer? What role does the designer play if they leave things to random chance? As graphic designers, exploring these questions will help expand how we define our agency within our work. My aim with this thesis is to engage in the community of generative artists using design to add to the dialogue through the discoveries I make in my work. I began drawing repeated lines with ballpoint pens a few years ago as a way to relieve stress by doodling. The lines started taking a quality of their own over time, depending upon both the steadiness of my hand and my level of patience. I was then introduced to pen plotters and decided to make the plotter draw a set of horizontal lines. I was captivated by the machine as it drew each line so accurately. Watching it was as therapeutic as drawing the lines myself. From there I began playing around with the plotter as a drawing machine. I have been working with various pen plotting/drawing machines to create a range prints. I started by creating abstract shapes and that lead to an exploration of moiré, a visual phenomenon that I was fascinated by, which then became central to my work. Something was mesmerizing about watching the plotter draw lines over and over again, slightly curving a little each time, and once you take a step back, a shape appears, and the lines seem to move, they start looking like they’re animated. Like a slow rolling wave on paper. The shapes were created digitally and drawn with pen plotters. I discovered that the moiré effect works best with black ink on white paper, it is sharper and looks more 3 dimensional. Creating the shapes with a pen plotter versus drawing them by hand would result in very different forms and line qualities. Plotting the same shape multiple times would often result in slight inaccuracies, each mistake would make the print more unique and more interesting than the digital drawing. For the purposes of consistency, I will use the term generative art throughout my thesis to refer to art or design that focuses on the process by which it was created. The term generative art will encompass other terms such as emergent, procedural, or algorithmic design. Can a machine originate anything? What is it like to be a computer that makes art? Can human aesthetics be formalized? What new kinds of art does the computer enable? In what sense is generative art representational, and what is it representing? What is the role of randomness in generative art? What can computational generative art tell us about creativity? What characterizes good generative art? What can we learn about art from generative art? What future developments would force us to rethink our answers? The first question – can a machine originate anything? – asks whether a machine can generate something new, meaningful, surprising and of value. Doesn’t the machine need human input? As generative artists, do we not make deliberate decisions? Are we creating the artwork or is the machine creating it? These questions led to me think about the 7th question – what can computational generative art tell us about creativity? How much creativity is derived from the program and how much from the programmer? What role does the designer play if they leave things to random chance? These questions about agency are significant in allowing us to understand and define our roles as designers. The aim of my thesis was not to answer any of these questions, but merely to engage in the community of generative artists through the discoveries I make in my work. I also hoped to create a body of work and develop myself as an artist throughout the year. The content of the projects gets smaller along the way, they go from macro to meso to micro; space, Earth, and micrometeorites. Here are some of the people whose work directly influenced my research. The use of plotters as drawing machines is increasing, although it is not a recent occurrence. The oldest plotter drawings I came across in my research were created in the sixties by Frieder Nake, Vera Molnar, and Manfred Mohr. These three artists were some of the first to experiment with plotters and have certainly paved the way for other artists. Their work and research are all based on algorithms. It is very structured and precise, yet there is always room for explorations. One of the first artists I’ve seen using a drawing machine. He uses a harmonograph as well as other drawing machines he built to draw visual representations of musical harmonies. Working with code is quite new for me. I always knew that some people created art with code but didn’t know how it was done. These artists have influenced my understanding of what generative art is and what it can be. I am mesmerized by lines and repetition, finding artists whose work is based on both things is always inspiring. The work is visually dynamic and often gives a 3-dimensional effect. Ryan Tippery, Kevin Townsend, and John Franzen are three artists I came across several years ago. They create all their drawings by hand. My work is heavily influenced by their research and work. I found their drawings when I began making my own and I consider them to be the source of my thesis interest. These explorations are not a project per-se-, however, they were the point of departure for my thesis. I began by experimenting on Illustrator, blending shapes together to create abstract forms. From there I discovered moiré and became fascinated by it. I continued creating moiré shapes and plotting them. At this point, I hadn’t developed my thesis yet and didn’t know which direction I would be heading in. I experimented with animating the moiré forms, first manually on Illustrator and then I discovered Nodebox, a Java software that allows you to create shapes. I began experimenting with it to try and animate, however, I never actually created any moiré forms. Instead, I began learning how to code through Processing. I realized the possibilities are endless and started considering using code for my thesis. At this point, the Cassini–Huygens spacecraft was ending its mission, and my interest in Saturn peaked. I began wondering if I could find ways to plot Saturn. I made a few quick prints of Saturn and the universe by taking images from NASA and image-tracing them on Illustrator. I also explored different colored pens and papers. One of the most exciting aspects of working with a plotter is that things never go according to plan. The most significant lesson I learned while working on these prints is to cherish these mistakes. In most cases, the plotter or pen errors made the print much more dynamic and exciting than it would’ve been. These mistakes can give life to the plotter, making it seem like it is making purposeful decisions. Ryan Tippery, Kevin Townsend, and John Franzen are three artists I came across several years ago. They create all their drawings by hand. My work is heavily influenced by their research and practice. I found their drawings when I began making my own, and I consider them to be the source of my thesis interest. I am mesmerized by lines and repetition, finding artists whose work is based on both things is always inspiring. The work is visually dynamic and often gives a 3-dimensional effect. My use of ballpoint pens was inspired by Fatma Al-Remaihi and Thomas Müller. Both artists have used blue ballpoint pens to create drawings by hand. They use simple lines in their drawings. However, the quality of their lines, as well as the use of movement and textures, bring the drawings to life. I was drawn to Al-Remaihi’s Hair Play series, her line quality and the textures she created were captivating. My use of plotters as drawing machines was inspired by Michael Hersrud’s plotter work. His graphic forms are inspired by spirographs and scientific phenomenon. He states “… drawing is not a physical gesture based on observational or intuitive processes, but systematic and computational procedures that take advantage of, exploit, and disrupt accessible digital tools and software.” This approach to drawing was new to me, and I was eager to explore it. I was curious about the process of creating the shapes as well as printing them with a plotter. This curiosity sustained my interest throughout the year and drove me to explore different directions. The explorations with Saturn led me towards other space phenomena, like galactic dust or cosmic dust. Galactic dust is all over space, it is extremely minuscule, yet it creates massive interplanetary dust clouds. Images of the dust clouds on NASA are colorized and look stunning. I liked the idea of taking something as large and unscalable as a galactic dust cloud and then plotting it at a much smaller scale. I used the Hubble Space Telescope images, image traced them in Illustrator and then plotted them. Image tracing led to a compelling line quality that I hadn’t come across in my explorations yet. That, coupled with the size of the prints and the type of ballpoint pen used, created detailed and textured prints. Some of them looked like the galaxies, others didn’t resemble space at all. This also led to a quick experiment in which I took some sand and scanned it, image traced it, and then plotted it. After working with space dust, I decided I would try working with dust in Doha, which is much smaller and more accessible. This experiment drew my attention to the way the images are translated in Illustrator – it creates outlines of the shapes. I wasn’t completely satisfied with the way they turned out, I wanted to be able to translate the dust particles more accurately. This experiment led me towards image mapping in my next investigation. This investigation began with an exploration of what image mapping is – translating pixel information from images into geometrical shapes. I started by inputting images through Processing and making adjustments to the code to change the lines, dots, and circles. The output depends on some factors, the most important being the brightness and contrast of the image. I could control the shapes, their quantity, appearance, size, and direction. I used images from space as well as a picture of an extratropical cyclone over Iceland as seen from space. I wanted to find out how many variations could be made with the same image. From there I moved to Google Earth and used images of different terrains. I was fascinated by the variety of textures on Earth. I decided to create maps with the pictures I found. I also used ‘The United States Geological Survey: Earth Resources Observation and Science Center’ to access more data on the landscapes that I chose. One side of the map displays the texture of the terrain from Google Earth, while the other side shows the height map data. A web-based tool created by Norm and Jürg Lehni that calculates all the possible combinations of some lines that you draw on the 9 point grid. Having gone from macro explorations of space and Earth, the final project deals with the micro. Micrometeorites are tiny pieces of meteorites that make it through Earth’s atmosphere. They range from 0.05mm to 2mm, they are made of minerals and are magnetic in nature. Put under a microscope, the micrometeorites are shiny and stunning. They are spherical due to the speed at which they fall and the heat they get exposed to when entering Earth’s atmosphere. The objective of this project is to visualize something so small in large quantities, using the available data about micrometeorites. I also wanted to work with Processing and learn more about coding. It is estimated that 4 tonnes of micrometeorites fall to Earth every day. That is equivalent 40 billion micrometeorites a day. Current data states that 1 micrometeorite falls in every square meter. Qatar is 132km2, which means that 36,164 micrometeorites fall each day. Taking all that data and working with a physics engine on Processing, I visualized the micrometeorites falling to Qatar in real time; 25 micrometeorites per minute. Processing randomizes the rate at which the 25 micrometeorites fall during each minute, making it seem more natural. The physics engine, despite it being challenging to work with, allowed me to alter the gravity, friction, and collision of the falling micrometeorites. This makes the micrometeorites look more natural as they fall and collide with each other. A 360 video by Scott Manley, visualizing what it would look like if we could see all the asteroids in space. To make the asteroids stand out against the stars and planets, he alters time so that we can see the motion of the asteroids. They move at a rate of 2 and a half days every second. This thesis has been a space for me to explore my interests and begin contextualizing them to the world around me. I wanted to create a body of work and develop myself as an artist. It was difficult for me to comprehend that I can create within a context. I first had to understand why I was creating work the way I was, what was the driving force, and how I could connect my interests to different contexts. It was a struggle at first to contextualize and remain honest with myself. Most, if not all my explorations, were driven by curiosity but feel unfinished. The turning point was the final investigation, which is conceptually more complete. I was able to use generative art within a context that I was curious about. I hope to continue further with these explorations, I would classify them into two different directions. One that focuses on creative coding, and one that focuses on creating different visual languages by taking the plotter prints further. -Autonomous: Independent and having the power to make decisions for itself. -Computational translation/machine translation: Using computers to translate visual input into and outputting a different result. -Moiré pattern: In mathematics, physics, and art, a moiré patterns are large-scale interference patterns that can be produced when an opaque ruled pattern with transparent gaps is overlaid on another similar pattern. For the moiré interference pattern to appear, the two patterns must not be completely identical in that they must be displaced, rotated, etc., or have a different but similar pitch. -Processing: A flexible software sketchbook and a language for learning how to code within the context of the visual arts. Artist or Creator, A. Year. Title: Subtitle. medium (if appropriate). Place: Publisher. Internet address. Heimans, Ralph. 1996. Gloves Off (Tom Uren). oil paint on canvas. Canberra: National Portrait Gallery. http://www.portrait.gov.au/portraits/2000.36/gloves-off-tom-uren. Al-Remaihi, Fatma. “Hair Play.” http://fatmaalremaihi.com/hair-play. Hersrud, Michael. “Pen & Plotter Algorithmic Drawings, Faculty Exhibition.” http://michaelhersrud.com/pen-plotter-algorithmic-drawings-faculty-exhibition. Lehni, Norm, Juerg Lehni. Sign-Generator 1.0. https://lineto.com/The Designers/Norm/Sign-Generator/Software/Sign-Generator 1.0/. Manley, Scott. YouTube. June 29, 2015. https://www.youtube.com/watch?v=huC3s9lsf4k. McCormack, Jon, Oliver Bown, Alan Dorin, Jonathan McCabe,, Gordon Monro, and Mitchell Whitelaw. “Ten Questions Concerning Generative Computer Art.” July 27, 2012. http://users.monash.edu/~jonmc/research/Papers/TenQuestionsLJ-Preprint.pdf. Riley, Bridget. “Bridget Riley on Bridget Riley.” Artlink, December 2004. https://www.artlink.com.au/articles/2036/bridget-riley-on-bridget-riley/. “Bridget Riley Feature.” Tate. http://www.tate.org.uk/art/artists/bridget-riley-1845. Tippery, Ryan. “10 by 10.” https://www.ryantippery.com/10by10. Townsend, Kevin. “10 by 10.” http://www.kevin-townsend.com/10by10/. -A meteoroid is usually a fragment of an asteroid. It can be very large, or it can be very small. A micrometeoroid is a particle smaller than a grain of sand. Every day, Earth’s atmosphere is struck by millions of meteoroids and micrometeoroids. Most never reach Earth’s surface because they are vaporized by the intense heat generated by the friction of passing through the atmosphere. I am exploring my role as a designer through generative art by creating work that is written by code and is generated by machines. My work is driven by my interest in the phenomenon of emergence and how complexity can arise from simplicity. I am also fascinated by visual phenomenon such as moiré and how it can give an illusion of three-dimensionality. The theme of order and disorder is common in my work. My aim with this thesis is to engage in the community of generative artists using design to add to the dialogue through the discoveries I make in my work. I am exploring my role as a designer through generative art by creating work that is written by code and is generated by machines. My work is driven by my interest in the phenomenon of emergence and how complexity can arise from simplicity. My experimentation with plotters helped me explore my fascination with visual phenomenon such as moiré, and how it can give an illusion of three-dimensionality. My aim with this thesis is to engage in the community of generative artists using design to add to the dialogue through the discoveries I make in my work. “Ritchie’s encyclopedic project (continually expanding and evolving, like the universe itself) stems from his imagination, and is catalogued in a conceptual chart replete with allusions drawn from Judeo-Christian religion, occult practices, Gnostic traditions, and scientific elements and principles. Ritchie’s paintings, installations, and narrative threads delineate the universe’s formation as well as the attempts and limits of human consciousness to comprehend its vastness. Ritchie’s work deals explicitly with the idea of information being “on the surface,” and information is also the subject of his work. “Other drawings, and especially those made with a combination of mediums, such as acrylic paint, graphite, colored pencil and Indian ink, express a sense of spontaneity. Those works contrast with Muller’s more precise ballpoint art. ‘My work evolves in movements which oscillate between different and complementing poles, like complexity and simplicity, fullness and emptiness, order and disorder, the pure and the impure, the geometric and the organic,’ he declares. “I began to use ballpoint pens by chance about 20 years ago, scribbling on little pieces of paper and quickly getting fond of this kind of marks – sometimes leaving large white areas, at other times marking very thickly and completely filling the surface. I did a lot of these accumulations of marks on little pieces of paper. I liked the immediacy, how the hand was so near to the mind. Then, slowly, my use of the ballpoint pen changed and I needed to work on large surfaces, on spaces that I call “corporeal”, one-to-one. I can move in front of my work – I always work vertically on canvases that I fix to the wall. I can reach the tip with my arms and make large marks. Sometimes, I am so forceful that the canvas is nearly carved. I go very near and lose myself in the micro vision and then step back to discover the full image. I like moving between the little and the large. I feel the space a lot: the horizon, the sky, and the planets, and also the little elements of reality, as though I can feel the particles of energy. When I began to draw with the ballpoint pen on large canvases, it was a little crazy making such tiny marks on large surfaces. And of course it took a lot of time, but I like this accumulation of matter and time, and of thoughts, of different moments of my days, the changing light, the usual accidents of everyday life. All are inside my work. The tip of the ballpoint pen is strong enough to use freely. I also like the way the pen accurately follows the rhythm of my work. In the more layered works, I use a lot of ballpoint pens of different brands, mostly Bic, Staedtler, Pilot. The work is really sedimentation. For the denser canvases, I use perhaps 30 to 40 pens for each one. Subtitle: Mark making explorations through generative and computational translations. 1- What is the condition? 2- What is the significance of the condition? Why is it significant to me, my community, culture, the economy, the world? How is it significant to a different range of contexts? Why should people care about this condition? Why is it important? Who is it important to? Who is the audience? 3- How do you want the condition to change, what effects do you want to achieve? 6- Randomness, art, and intentionality. 7- What is the value of creating art with a machine vs an analog method? 1-can a machine generate something new, meaningful, surprising and of value: a poem, an artwork, a useful idea, a solution to a long-standing problem? 2-If a computer could originate art, what would it be like from the computer’s perspective? I am interested in exploring drawing machines and the possibility of creating them myself, as well as using different machines to explore the variety of outcomes. Exploring what a computer can do- how to create shapes/patterns through code? can a computer draw for you? what is the value in this? will the drawings lose the ‘artist’s touch’ because they were created by a computer? I am investigating the agency of drawing via Nature, Code, and People. With nature, I am exploring? with Code I am exploring ? with People I am exploring? I intend to use a series of techniques to aid in the production of drawing. one will involve wind. one will involve mass people, one will involve the use of Processing and random numbers. My goal is to see how drawing can be used to aid visualization in design as part of communication and the abstraction of nature. Is it art if it is created by a machine? Is it more/less significant if it is created with/without a machine? What is the role of the designer if you hand it over to random chance? 1-What can computational generative art tell us about creativity? 2-What is the role of the designer if you hand it over to random chance? 3-can a machine generate anything? ( as in, can a machine do something new, meaningful, surprising and of value? -raising questions about the nature of creativity & art through the McCormack’s questions about generative art. Does each individual piece convey something? Or do they serve a larger body of work? What makes a drawing successful and what doesn’t? Is the process more important than the outcome to me? Do I want to explore the process or the outcomes, or both? Art Assignment – do machines make art? 1-What is the value of creating art with a machine vs an analog method? 2-How do you connect code to nature? Drawing to nature? What if the computer could act more like an equal, or at least as an inspirational assistant, understanding an artist’s own style and abilities, interacting with them as they generate new art? The computer could then challenge the artist to forge new ideas, and support or critique them as they emerge – akin to working with an artistically sensitive human partner who understands and buoys one’s own originality. This system would encourage learning and practice by adapting to each individual’s current style and technical abilities, developing in sophistication and empathy just as the human artist’s own abilities mature. -can a machine truly originate artwork? does it not need human input? as generative artists, do we not make deliberate decisions? are we creating the artwork is the machine creating it? -the significance of all this? -how are you using (graphic) design? These are screenshots from Google Earth of different parts of the world. The foldout works, although there are a few issues with alignment. But I’m still not quite sure about using 4 images of earth. Someone suggested that I start with a print of earth, and then as you unfold, you would see an image of the next largest planet after earth, mars, and then the next print would be jupiter, and then the final one would be saturn. I think it would make more sense to have an image of 1 thing that changes or grows over time. I had a few different ideas, like a supernova over time, or a black hole, or a glacier melting. I also think I need to use different colors for each print, it would also be great if I can have filled in shapes instead of just outlines. The issue is that one side of the foldout has 3 prints, once it is opened completely and you can see them all together, they are a little difficult to distinguish, and also don’t look connected (because they aren’t). Currently testing these 4 prints in one foldout. I used processing to translate these images into prints using either diagonal lines, squares, or circles. moments from what feels like a lifetime ago. crazy how weird time is. sunrise on a mountain in Muangphaem, Thailand. still the best sunrise i’ve ever seen.